You are using an outdated version of Internet Explorer. It has known security flaws, this website and others will not display correctly and many features will not work. Learn how to update your browser. We sent our best quiz team to Capella’s inaugural charity quiz in aid of London’s Air Ambulance. And the result…? Well, it’s the taking part that counts! On Thursday night we sent our enthusiastic quiz team to a charity quiz night hosted by PR firm Capella. 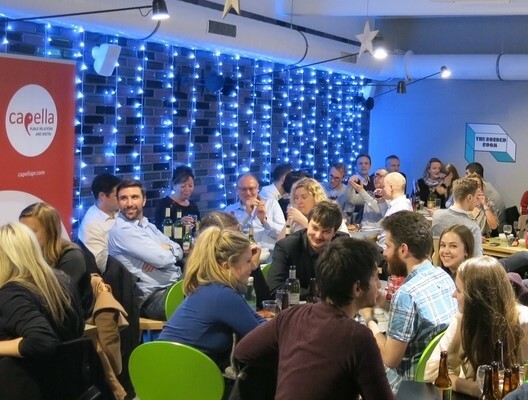 As the first charity quiz Capella has hosted, it was a huge success with over a hundred people attending. It was in aid of London’s Air Ambulance and an amazing £3,300 was raised. Despite trying our best (and excelling in the Musicals round) we didn’t quite win- it seems our expertise is in technology, not general knowledge! We didn’t let our loss dispirit us, however, and had a fantastic evening raising money for a great cause. London’s Air Ambulance is a charity that delivers a trauma team to critically injured people in London. It’s currently raising £6 million to fund a second emergency helicopter, which will allow medics to reach 400 more patients each year. The funds raised during the evening will go towards getting the helicopter in the air in 2016 and keeping it running for five years. Currently, the charity treats an average of five seriously injured people in London every day. Their helicopters are in the air within 4 minutes of activation, and constantly monitor 999 calls. They perform life-saving treatments that are usually reserved for emergency departments, and are lifesavers to those who have been injured all across London. We were delighted to be a part of such a worthwhile evening and are already looking forward to next year’s quiz. Get your credit report and credit score for free. Forever. © Clear Score Technology Ltd. All Rights Reserved.